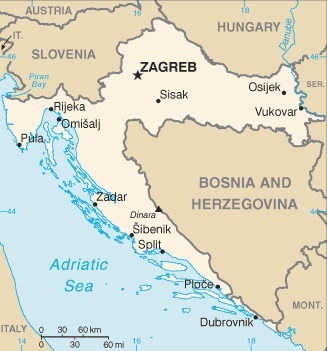 The Republic of Croatia is a country in East-central Europe. It has land borders with Bosnia and Herzegovina, Hungary, Montenegro, Serbia, and Slovenia, and is divided into two parts by the Bosnia's short coastline, which is closed to the town of Neum. Croatia itself has a long coastline on the Adriatic Sea, and also contains many islands in that sea. As of 2007, Croatia had an estimated population of 4,437,460. The largest city in the country, by a considerable margin, was the capital, Zagreb, with a population of around 0.7 million. Croatia had a difficult transition from Communism (when it was part of Yugoslavia), involving both war and economic dislocation. However, these difficulties are now being overcome, and the country is a candidate to join the European Union in the next few years. Services in general, and tourism in particular are important parts of the modern Croatian economy. Even during the Communist period, Croatia was a fairly popular tourist destination, and this is even more true nowadays, with 8.9 million foreign tourists visiting the country in 2006 alone. Lonely Planet’s Croatia is your passport to the most relevant, up-to-date advice on what to see and skip, and what hidden discoveries await you. Sail the island-speckled coastline, marvel at historic forts and mansions, and walk Dubrovnik’s city walls – all with your trusted travel companion. Get to the heart of Croatia and begin your journey now! The Perfect Choice: Lonely Planet’s Croatia is our most comprehensive guide to Croatia, and is perfect for discovering both popular and offbeat experiences. Explore miles of beaches, clear water, and beautiful castles used on popular television shows in Croatia. See history, art, and more in this special city. Discover DK Eyewitness Travel Guide: Croatia. With hundreds of full-color photographs, hand-drawn illustrations, and custom maps that illuminate every page, DK Eyewitness Travel Guide: Croatia truly shows you this country as no one else can. Discover Croatia with this essential travel guide, designed to help you create your own unique trip and to transport you to this beautiful country before you've even packed your case - walk the marble streets of Dubrovnik, dip your toe in the azure waters of the Dalmatian Coast, tuck into pasta in Split or marvel at waterfalls in Plitvice Lakes National Park. The DK Eyewitness Guide to Croatia covers the must-see sights and the hidden backstreets, so you won't miss a thing. * Reasons to love Croatia: incredible architecture, natural wonders, breathtaking beaches - what will yours be? * Hand-drawn illustrations show the inside of the must-see attractions, including Pula's Roman amphitheatre, Palaca of the Diocletian and Poreč's Euphrasian Basilica. * Covers Istria and the Kvarner Area, Dalmatia, Zagreb, Central Croatia, Slavonia and Baranja, and the Northern Counties. DK Eyewitness Travel Guide Croatia is a detailed, easy-to-use guide designed to help you create your own unique trip. On a shorter trip? Try our DK Eyewitness Top 10 Dubrovnik. Cypress-lined beaches, sunny islands, perfectly-preserved medieval towns―Croatia is the European hot spot for beach lovers, cultural explorers, and yachting revelers. From outstandingly well-preserved ancient structures like Dubrovnik's fortified bastions to the rolling vineyards of Istria, Croatia is loaded with interesting things to see and do, and Fodor’s Essential Croatia covers the best of them. This full-color guide includes reliable and comprehensive coverage of all the sights and attractions, from walking a circuit of Dubrovnik's city walls to exploring the labyrinthine streets of Split to savoring the food, wine, and breathtaking nature of the Dalmatian islands. The Rough Guide to Croatia offers practical, informed advice on how to enjoy everything from sea-kayaking and mountain hiking to sunbathing and swimming to the best in contemporary art, culture, and clubbing. Up-to-date listings pinpoint the best cafés, hotels, shops, nightlife, and restaurants for all budgets, ensuring you have the most memorable trip imaginable. Make the most of your time with The Rough Guide to Croatia. From deciding when to go, to choosing what to see when you arrive, this is all you need to plan your trip and experience the best of Croatia, with in-depth insider information on must-see, top attractions like the walled city of Dubrovnik, cosmopolitan Split and the stunning islands of Hvar and Vis, and hidden cultural gems like the Baroque architecture in inland Osijek. True to its name, DK Eyewitness Travel Guide: Top 10 Dubrovnik & the Dalmatian Coast covers all the region's major sights and attractions in easy-to-use "top 10" lists that help you plan the vacation that's right for you. This newly updated pocket travel guide for Dubrovnik and the Dalmatian Coast will lead you straight to the best attractions these cities have to offer, from the Ancient City Walls to a restful day on the pristine beaches. Expert travel writers have fully revised this edition of DK Eyewitness Travel Guide: Top 10 Dubrovnik & the Dalmatian Coast. • Brand-new itineraries help you plan your trip to these areas of Dubrovnik and the Dalmatian Coast. The perfect pocket-size travel companion: DK Eyewitness Travel Guide: Top 10 Dubrovnik & the Dalmatian Coast. Recommended: For an in-depth guidebook to Dubrovnik and the Dalmatian Coast, check out DK Eyewitness Travel Guide: Croatia, which offers a complete overview of this country; thousands of photographs, illustrations, and maps; and more. You can count on Rick Steves for what you really need to know when traveling in Dubrovnik. In this slim guide excerpted from Rick Steves Croatia & Slovenia, you'll get Rick's firsthand, up-to-date advice on the best sights, restaurants, and hotels in Dubrovnik and beyond. With Rick's advice, you'll stroll the Stradun Promenade, take a cable car to the top of Mount Srd, and sip cocktails at a cliffside bar. Rick covers day trips throughout the region as well, including Kotor in Montenegro, Mostar in Bosnia and Herzegovina, and island and mainland destinations in Croatia, with helpful maps and self-guided tours to keep you on track. You'll learn to travel smart and get around like a local as you hike through Mljet National Park, shop for unique goods at the Turkish-style bazaar in Mostar, and relax on the beach along the Budva Riviera. More than just reviews and directions, Rick Steves Snapshot Dubrovnik is truly a tour guide in your pocket. Spending more time in the area? Pick up Rick Steves Croatia & Slovenia for in-depth coverage, detailed itineraries, and important planning information for a multi-country trip.